Click on images for large, high resolution versions! This webpage is in a preliminary state and more photographs and information will soon be added. Some notes on safety are included here, but they are intended for persons considering geological studies. They may or may not be relevant to long walking expeditions across Dartmoor, rock-climbing or other non-geological activities. Those activities have their own particular risks which sometimes may be different from those affecting people involved in geological studies. Dartmoor can at times be cold, wet and windy and suitable weather-proof clothing and sturdy footware should be worn. There definately can be risk of hypothermia. Waterproofs ought to be carried. A map is needed and a directional device such as a compass, gps or satnav should be carried anywhere when out walking on the moorland of Dartmoor. A mobile phone and torch and perhaps a whistle could be useful in case of emergency. Students and others should take precautions if dealing with stream water, in case of risk of Leptospirosis. If rocks are hammered splinters may fly off. Hands should be cleaned and there should not be the eating of food after handling stream water. Swimming in the river is not recommended. There is risk of falling from rocks or slipping on rocks when on tors or cliffs, and normal precautions should be taken. Hazardous rocks should not be climbed. Dartmoor ponies should not be handled. Beware of bogs in some locations. Roads on and around Dartmoor are often narrow with limited visibility. Be careful when you walk on the roads which are often narrow. Be careful that you do not park a car or other vehicle in a dangerous place. Incidently, remember that vehicles containing valuable items and left in remote places might be broken into by thieves. In general, this website does not recommend that you proceed to any particular place and it is up to you as to whether you do so in the weather and other conditions at the particular time. You must make your own risk assessment at the time of any visit and judge for yourself where to go and whether to go, and this may be dependent on weather conditions in addition to other factors. 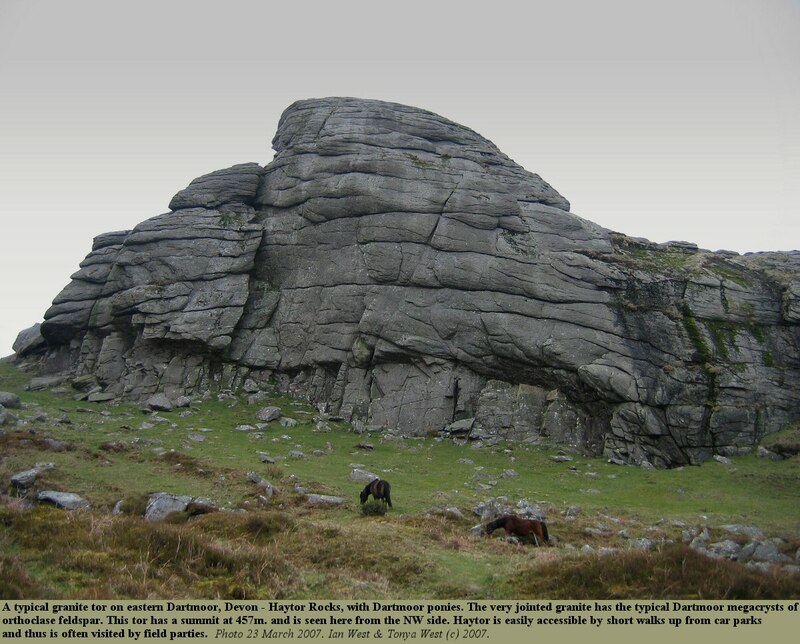 This is just the beginning of a geological webpage on Dartmoor. It is very small and minor at the moment with only a few selected localities. It is intended to be the merely starting basis for a larger and much more comprehensive webpagem, to be built up progressively. 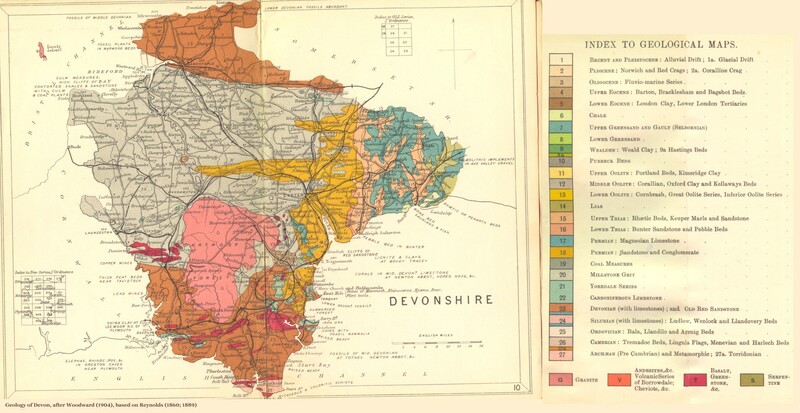 For purposes of location of Haytor (or Hay Tor) Rocks and geological setting there is shown above a general geological map of Devon and also an old geological map, dating from 1911 of part of eastern Dartmoor (survey of Ussher, Barrow, Sherlock, MacAlister, Dewey and Bromehead on a 1908 base map with railways inserted to 1911). Fortunately, development has been limited on Dartmoor and the road system is much the same. If possible, purchase modern geological and topographic maps and compare with the old maps. To drive to Haytor Rocks proceed southwest from Exeter on the A38 Plymouth road. Turn off to the right when in the Newton Abbot area. Note that the roads near Haytor are rather narrow lanes. Coaches can get to the car parks. 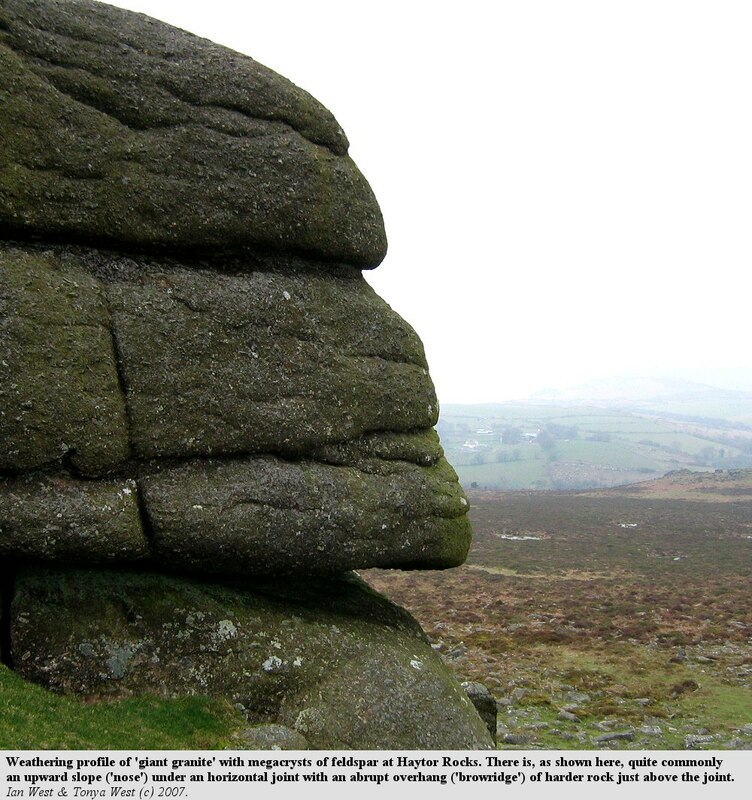 There are two car parks from which Haytor Rocks are easily reached by short uphill walks. One of the car parks is directly south of the tor and is on a coll at SX 759767. There are no facilities here. Another is east of the tor at SX 765772. Here there is an information centre open at certain times. There are also toilets that are generally open. This is probably the best place for a coach party. The main exposure at the Tor is of megacryst granite (also known as "Giant Granite" or "Big-Feldspar Granite"). It is probably from near the roof area of the batholith. The feldpars are of perthitic orthoclase that is porphyroblastic (later replacive crystals) in origin and not phenocrysts (large crystals that have developed in the magma). In some places the southwest England granite megacrysts have been seen to develop into aplite (fine-grained quartz-feldpar veins of late origin), which is possible for porphyroblasts (developing by replacement after the veins) but not for phenocrysts (early and which should be cut through by the veins). A porphyroblast is a large mineral crystal in a metamorphic rock which has grown within the finer grained groundmass. Porphyroblasts are commonly euhedral crystals, as in the case of the Dartmoor Granite examples, but in other circumstances can also be partly to completely irregular in shape. "Hayton (SX 758771) and adjacent quarries (760774; 755773; SX 750777): Sections in richly and poorly megacrystic granite, and also one apparently intrusive, megacryst poor, fine granite sheet are seen here. Xenoliths abound in the top exposures. Jointing is particularly well developed in both the tor rocks and in the granite quarry. 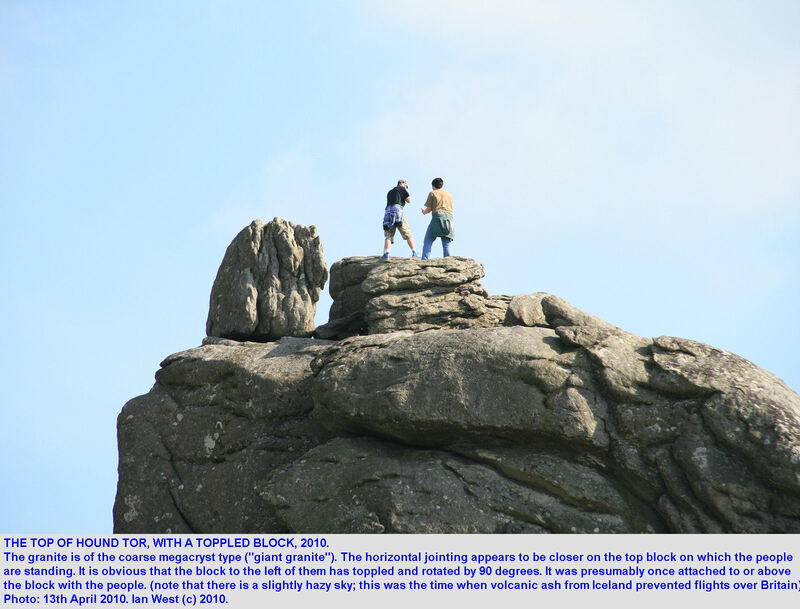 All exposures occur on open ground and can be reached from the Hay Tor car park. Popham, C. 2010. The Granite and Quarries at Haytor. 12 September 2010. This is a very clear and easily readable account of the Tor and Quarries with sketch diagrams. A profile caused by the weathering of horizontal joints at Haytor is shown above. The vague similarity to Easter Island statues results from a sloping weathering profile beneath the joints and then an abrupt overhang caused by harder, less weathered granite immediately above the horizontal joint. The "big-feldspar" porphyroblasts of perthitic orthoclase are clearly seen here. Castle Drogo is a large relatively modern castle of Dartmoor Granite, not built on the Dartmoor Granite but on a spur of metamorphosed Carboniferous rocks of the aureole. 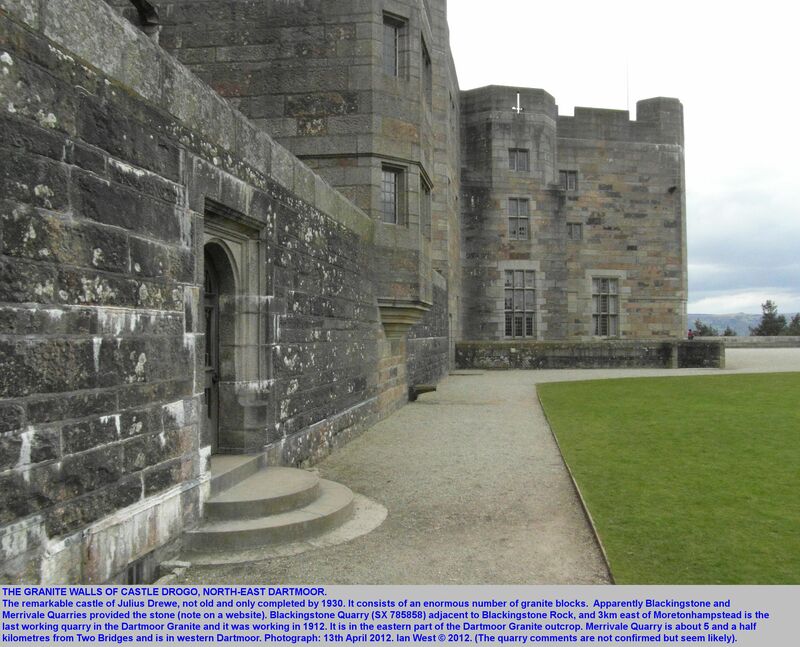 The descriptive section here is concerned with the geology of Castle Drogo, and other aspects are not discussed in detail. For information on visiting Castle Drogo go to the National Trust website: Castle Drogo, the last castle to be built in England, with dramatic views over Dartmoor. Castle Drogo, near Drewsteignston and Chagford is an extraordinary building, designed by Sir Edwin Lutyens, and made of blocks of Dartmoor Granite. It is not old and was built from 1910 to 1930 but it is in the old-fashioned style of a castle. A huge number of granite blocks have been used in its construction. It was specially built for Sir Julius Drewe (originally Drew), a wealthy businessman. Apparently some of the Drew family still reside there. The building had central heating and electricity supplied by a small hydroelectric plant in the narrow Teign Valley below. The ruins of this can still be seen. Most of the Castle Drogo building is open to the public by the National Trust for an entry fee and it is well-worth a visit. It is a dramatic scenic attraction. There is a good historic account in the Daily Mail article: Faulty Towers: Built by a clergyman's son to boost his social standing, Britain's newest castle is crumbling, like its founder's dream. 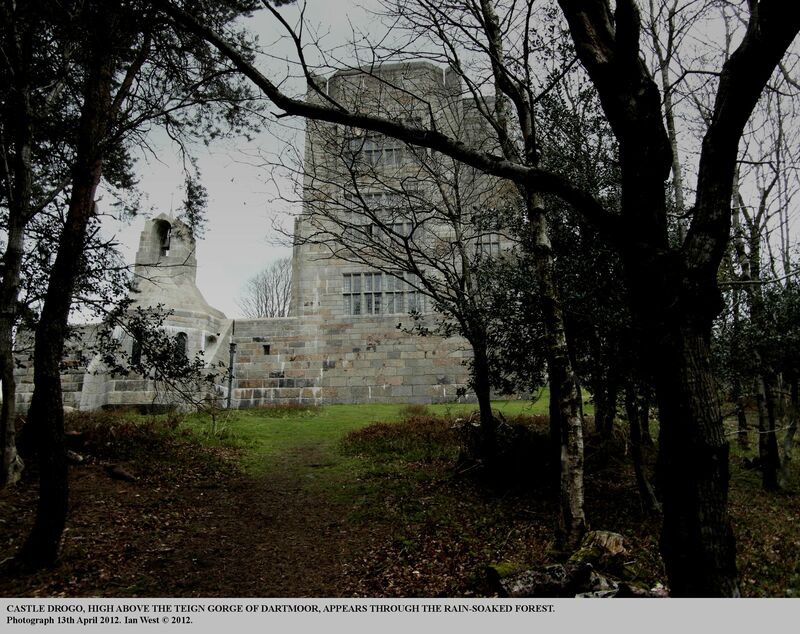 (For more photographs see also: Castle Drogo, a 20th century granite masterpiece ..). Castle Drogo is situated on the Carboniferous aureole of the Dartmoor Granite, just a short walking distance from the granite outcrop. Both the granite and the aureole rocks are easily seen in a short walk from Dogmarsh Bridge (Sandy Park) into the Teign Gorge and up the steep northern side to the castle. The building can also be visited directly by car by driving to the National Trust centre and paying a fee. Down in the gorge below the castle there are the remains of the small, hydroelectic plant, that supplied the castle with electricity for illuminating the many paintings. The sites of the quarrying for the granite of the castle are mentioned on a website as having been the Blackingstone Quarry, (SX 785858), which is relatively close and is the last working quarry on Dartmoor. It was working in 1912 when the castle building work was commencing. This quarry is 3km to the east of Moretonhamstead and has a satisfactory road link to Castle Drogo. Merrivale Quarry, also mentioned on a website as another source of granite blocks is further away and is west of Two Bridges in western Dartmoor. The quarry locations mentioned here have not been confirmed. Tourmaline is commonly recognised in the field in Devon and Cornwall, as though it was a single mineral. In fact "tourmaline" is a group of 11 minerals. The common black (in field appearance) mineral is southwest England is probably mostly schorl, but this is generally referred to in the local literature as tourmaline, and is not often analysed. Microscopically the colour of the tourmaline may be blue or brown but this may not be seen in the field; it is just the very dark colour that is obvious. In composition it is a complex boron and aluminium silicate with some iron (or magnesium etc). The interesting aspect is the presence of boron. The origin of the boron is a topic of special interest. Tourmaline belongs to the trigonal crystal system and has a hardness of 7 to 7.5 (i.e. it is hard like quartz and cannot be scratched with a knife). Its very dark colour and vitreous lustre is distinctive in the area of the granites of southwest England. It often shows crystal faces. It is extremely common, particularly in faults and fissures and often found with quartz, producing black and white veins. 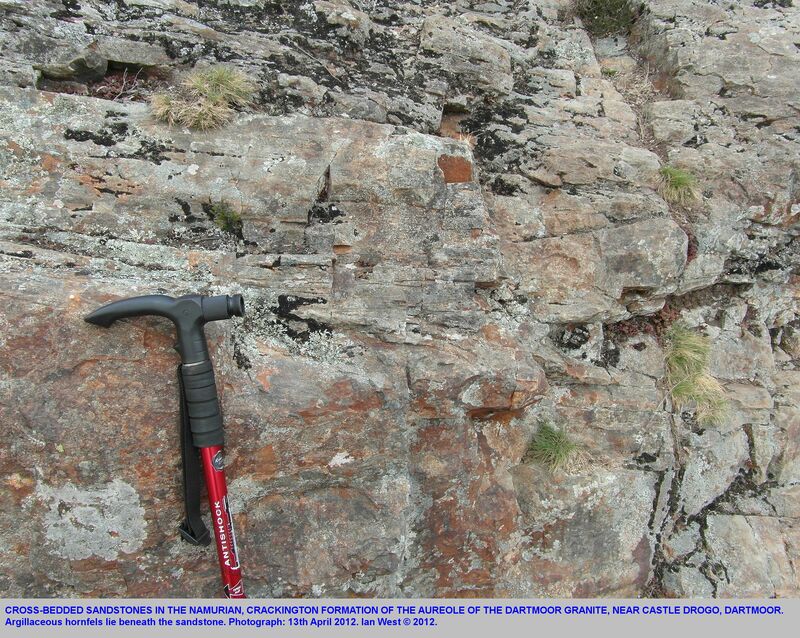 It is generally one of the most common late vein minerals associated with the granites. It is frequently seen in the field and is not valuable (valuable, coloured varieties do exist, but not usually here). In the Castle Drogo area pebbles or cobbles consisting of quartz and tourmaline veins are easily seen in the banks of the River Teign. The dark vitreous mineral should not be mistaken for the tin ore - cassiterite, which is much more difficult to find. Because tourmaline is a constituent of veins in the Dartmoor granite it is usually a late product. The granite emplaced about 298 million years ago, had cooled sufficiently to fracture in a brittle manner. Perhaps the granite was down to only 250 or 300 degree C. However, it certain cases the tourmaline is found more dispersed within the granite, rather than just in veins. A rock with dispersed acicular "suns" of black tourmaline is know as Luxullianite. It takes its name from Luxulyan near St. Austell. This rock type is apparently the result of metasomatic replacement of granite in situ, according to Lister (1978) (and not from the emplacement within the granite batholith of a late stage boron-rich magma). A single block of luxullianite with even-dispersed "suns" of fibroradiating tourmaline was noticed in the Castle Drogo building. Many of the crystals are acicular (needle-shaped). Thus, although, the tourmaline percentage is not very high the luxullianite features are very obvious and are typical. The feldspar is reddish, a feature noted in luxullianite by Lister (1978) and attributed to iron oxide content. It is odd that a luxullianite block should be present in Castle Drogo. To a non-geologist it might have been mistaken for ordinary Dartmoor granite, but a close look immediately shows that it is different. I saw it only during a hasty and superficial examination of some of the building blocks. It was briefly photographed, as shown above, but no search was made for other blocks. They are quite likely to be present in the walls of this substantial building, and now one has been seen, other should be easily found. It is not know at present as to which from which quarry this has come. Perhaps the matter can be followed further. 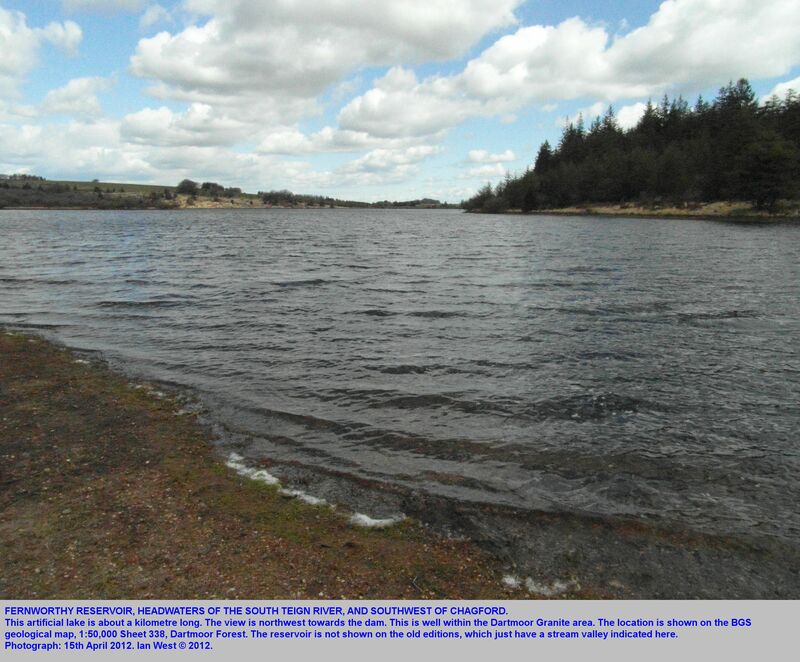 On Dartmoor, luxullianite has been found as a dyke-like occurrence in the Reservoir Quarry, northwest of Holne village, Dartmoor (Blyth, 1949). The tourmalinisation is related to fractures. This aerial photograph shows the position of Dogmarsh Bridge, near Chagford in northeast Dartmoor. 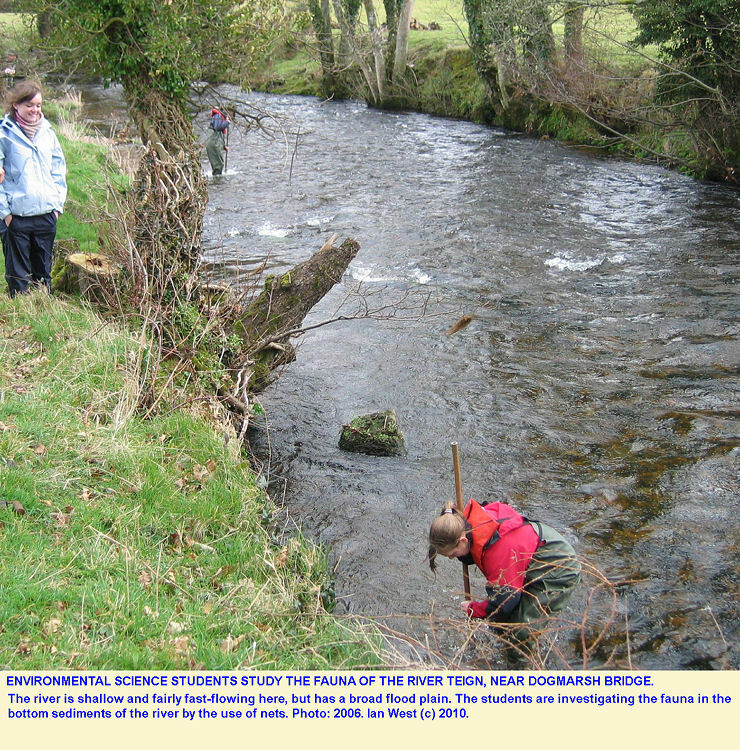 The River Teign can be studied here and there is a footpath alongside the river. The particular site is unusual in that there is a wide floodplain, even though the river is still in the Dartmoor area, and downstream there is a steep-sided valley. A short distance east of Sandy Park, where there is a broad flood plain of the River Teign, the valley narrows to the Teign Gorge. After only a short distance into this the aureole rocks are exposed here and there. It is, of course, immediately obvious that the outer boundary of the granite has been passed. The strata are of the Crackington Formation of Namurian age. Locally this is known as "Culm". A photograph above shows some hard, hornfelised sandstone of the Crackington Formation. They show some interesting sole marks. Some of the Namurian sandstones show cross-bedding. 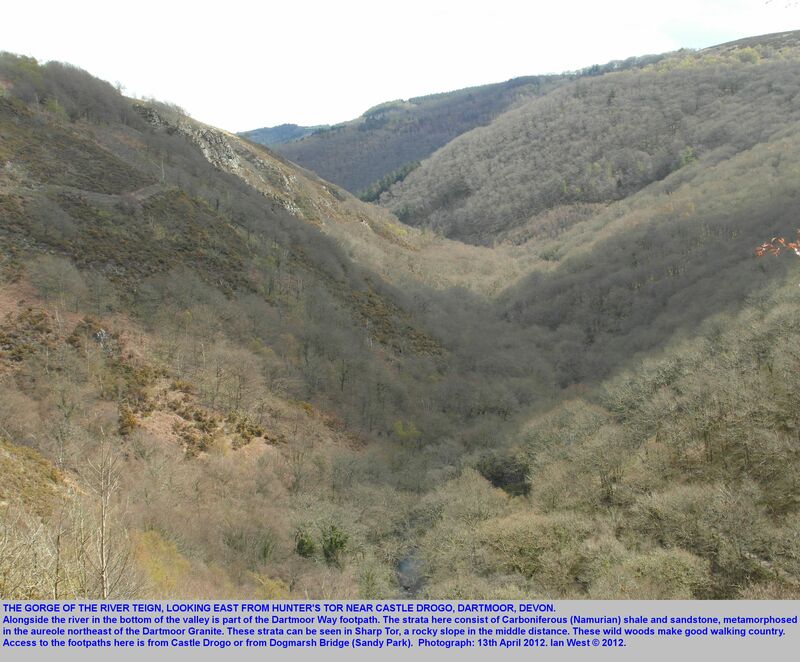 Small exposures can be seen at various places adjacent to footpaths in the gorge and adjacent to the path up from the river to Castle Drogo. 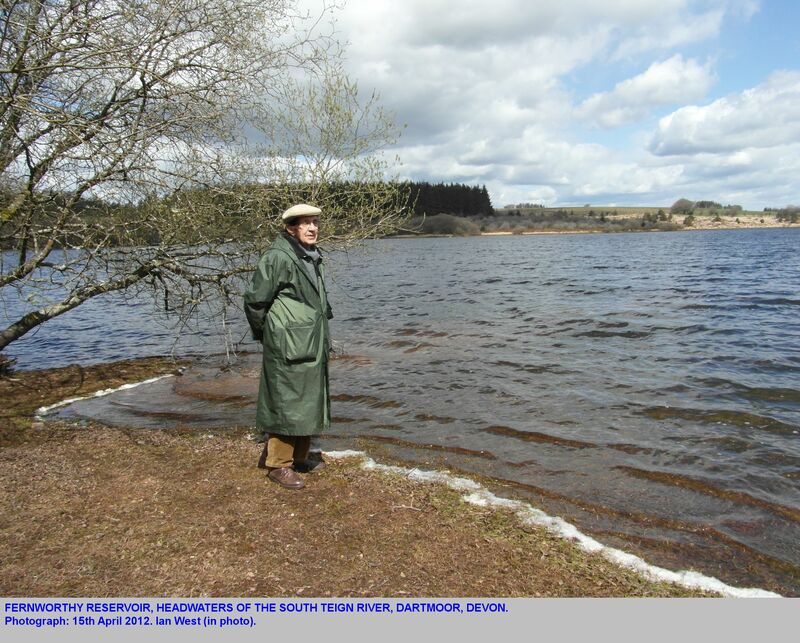 The uppermost part of the South Teign River has been dammed at Fernworthy. The location is on the Dartmoor Granite southwest of Chagford. Several small streams flow into this reservoir. Adjacent to this is Fernworthy Forest, a planted coniferous forest, but with what seem to be quite large Douglas Fir trees, a little reminiscent of Oregon. I am particularly grateful to the Staff of Environmental Science at Southampton University for the opportunity to attend many student field courses based at Exeter University, mostly at St. Lukes Campus. Dr. Malcolm Hudson, Dr. Paul Kemp, Dr. John Jones, Dr. Simon Kemp, Professor Ian Williams and other members of staff have made this possible. I am very much obliged to various student parties on field trips to the Dartmoor area. Individual students have assisted in various ways; I thank Tristanna Cornwell for kindly providing some photographs shown above. Student project work and evening discussion have been very helpful. 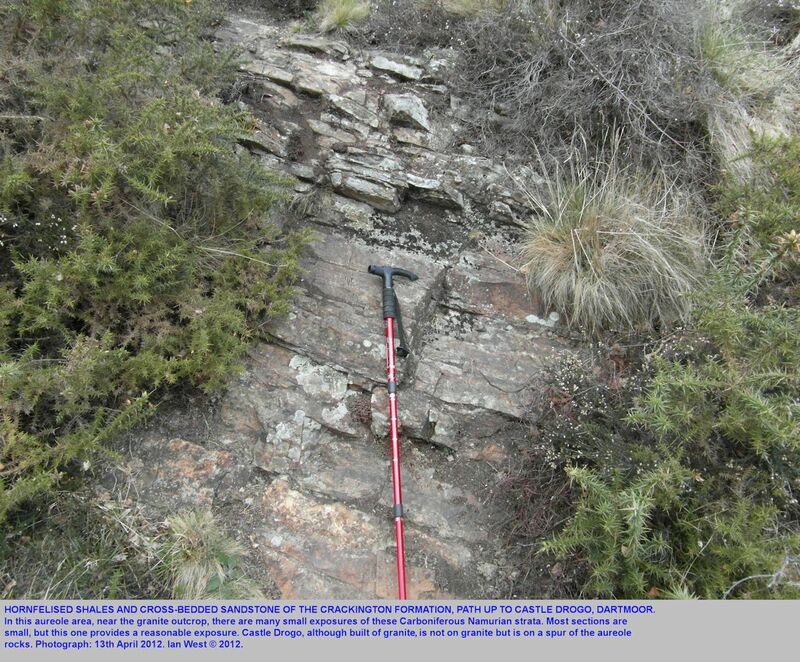 Geological field trips from Southampton University have taken place in the past and have provided further information. Other work has taken place privately by the writer and more will do so and thus provide additional material. Blyth, F.G.H. 1949. A "luxullianite" from east Dartmoor. Geological Magazine, May 1949, v. 86, pp. 175-179. This paper describes a dyke-like occurrence of luxullianite in granite at the Reservoir Quarry, northwest of Holne Village, Dartmoor (about 4km northwest of Buckfastleigh). The dyke-like mass of luxullianite type is emplaced along a line of fracture which crosses granite in a zone of pneumatolytic reddening, and was exposed in a quarry face. Extensive tourmalinization is related to post-emplacement fractures which traverse both the luxullianite and the adjacent rocks. British Geological Survey (BGS) . 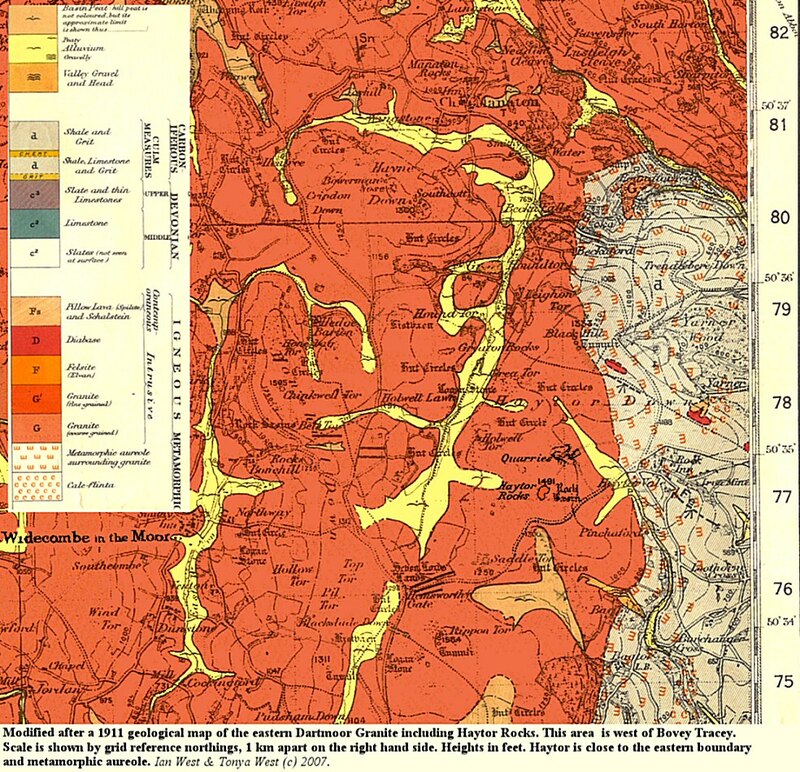 1:50,000 Geological Maps, various dates (some available folded, some flat, some solid, some drift and and some solid and drift): Obtainable from British Geological Survey (BGS) Bookshop Online. No. 338. Dartmoor Forest. Drift. British Geological Survey. 1968. Geology of the Country Around Okehampton. (reprinted in 1989). 256pp. By Edmonds, E.A., Wright, J.E., Beer, K.E., Hawkes, J.R., Williams, M., Freshney, E.C. and Fenning, P.J., with contributions by Ramsbottom, W.H.C., McKeown, M.C. and Lovelock, P.E.R. London Her Majesty's Stationery Office. (Available for purchase from the BGS Bookshop for 15 pounds stirling plus postage). 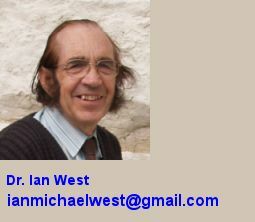 This is the BGS memoir for the BGS Okehampton Sheet, one inch to one mile or 1:50,000 series, Sheet 324, Solid and Drift. British Geological Survey Map. Okehampton, Sheet 324. Solid and Drift. One inch to one mile series and now 1:50,000. No. 324. Okehampton, Solid and Drift (available folded). (includes Okehampton, Hatherleigh, Bridestowe, Chagford and Moretonhampstead). Editions following from Old Series Sheets 25 and 26, published in 1835, revised 1839. Resurveyed on the six inch scale in 1962 by Edmonds et al. Published 1969. Price for the 1:50,000 edition from the BGS Bookshop Online - 12 pounds stirling plus postage. 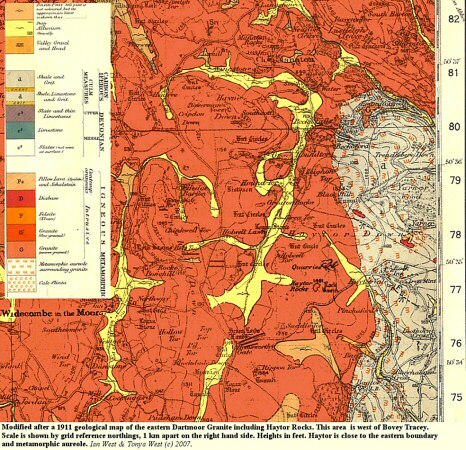 British Geological Survey 1984. Geology of the Country around Newton Abbott. Memoir for the 1:50,000 geological sheet 339, Newton Abbott, Solid and Drift Edition, New Series. 212pp. Obtainable from British Geological Survey (BGS) Bookshop Online. EM 339, Map price (2012) 12 pounds sterling; Memoir price (2012) 25 pounds sterling. By Sellwood, E.B., Edwards, R.A., Simpson, S., Chesher, J.A., Hamblin, R.J.O., Henson, M.R., Riddols, B.W. and Waters, R.A.. 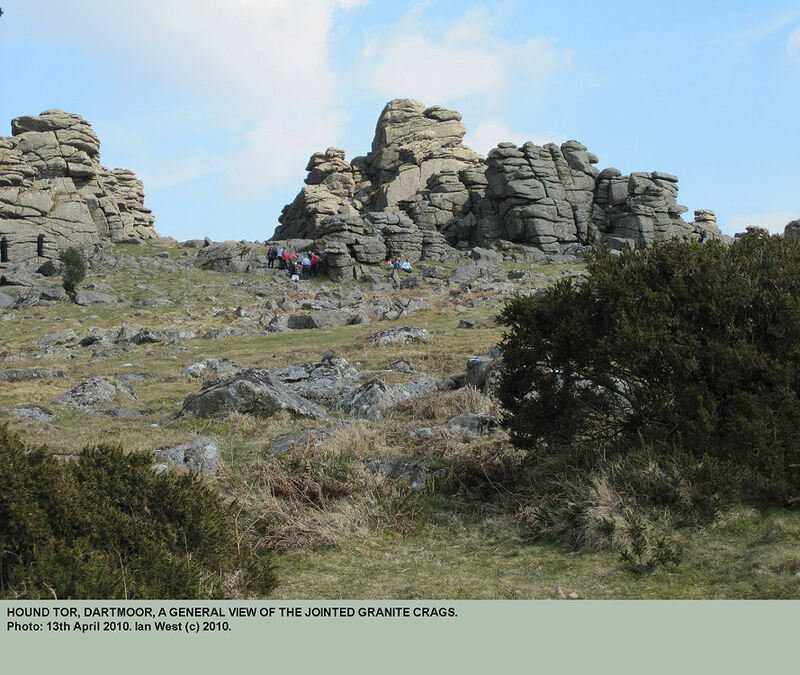 Contributors: Dartmoor Granite - Hawkes, J.R. and Bisson, G.; Economic Geology - Scrivener, R.C. ; Geophysics, Riddler, G.P. ; Palaeontology - Matthews, S.C., Ramsbottom, W.H.C. and Wood, C.J. ; Water Supply - Edmonds, E.A.. Research commissioned by the Natural Environment Research Council from the University of Exeter. Directors and Supervisors of Research - Selwood, E.B. 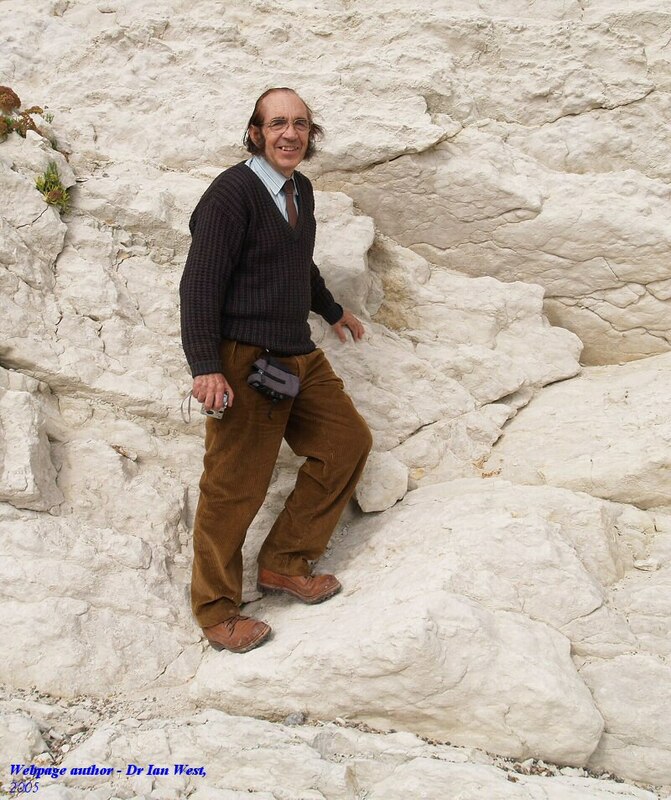 and Simpson, S., University of Exeter, and Bisson, G. District Geologist, Institute of Geological Sciences. Research Assistants: Chesher, J.A, Edwards, R.A., Hamblin, R.J.O., Henson, M.R., Riddolls, B.W. and Water, R.A. The Newton Abbot district (Figure 1) is bounded by the sea and in the east by the coast from just north of Torquay to Budleigh Salterton. Only three-fifths of the sheet area is land, but the limited area contains several contrasted rock types. In the east a fertile lowland of deep red soils underlain by Permian and Triassic rocks drains to the River Exe (Figure 2). It is bounded to the east by a west-facing escarpment of pebble beds and sandstones dipping eastward off the siltstones and mudstones of the lowland. From the top of the scarp, an area of heath and coniferous woodland, there are magnificent views westward to the flat-topped skyline of the Haldon Hills and the farther silhouette of Dartmoor. West of the lowlands the Haldon Hills form a north-south plateau at about 240m above sea-level, which is the interfluve between the River Exe and the River Teign. They constitute an outlier of typical east Devon landscape, expressing the underlying structure of flat-lying gravels of the Eocene on soft Upper Greensand, capping gently eastward dipping red rocks. The Dartmoor upland extends into the north-west corner of the district as an expanse of granite country rising to over 300m above sea-level. Between the granite and the Haldon Hills is a tract of charming hilly country about 5km wide, with characteristically steep gradients but no great elevation. It is underlain by mainly Carboniferous shales and sandstones whose structural trend is roughly east-west. The larger folds are distinct in the Teign Valley, making obvious features in the landscape. In general the oldest (Upper Devonian) strata crop out nearest the granite and there is a regional dip away from it. Similar countryside lies west of the Bovey Basin, around Islington. 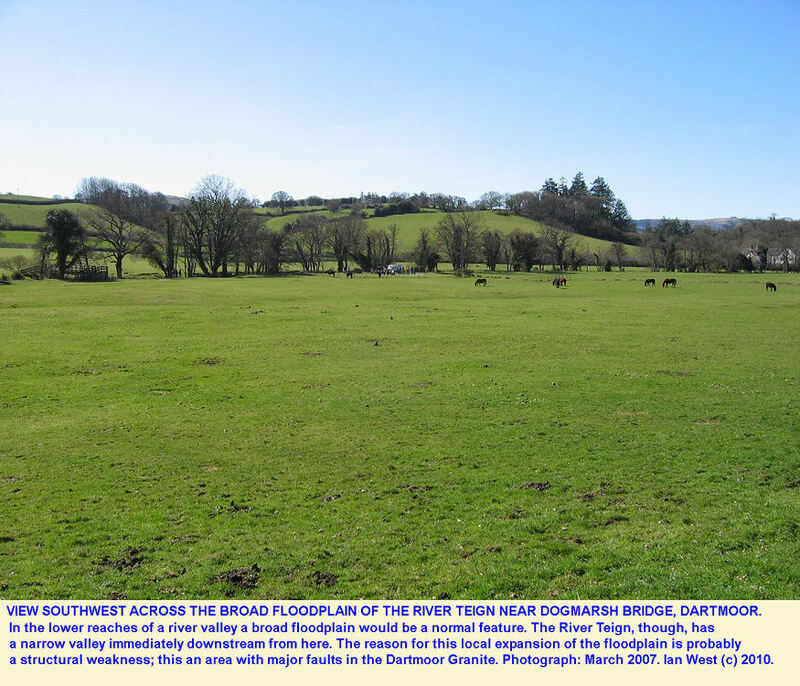 In the southwest corner of the district, west of Newton Abbot, highly variable topography reflects the contrasting resistances to denudation of the massive limestones and soft slates of the Middle and Upper Devonian. The slates have been reduced to a low plain broken by numerous isolated hillocks marking igneous intrusions and lavas. The limestone outcrops are bounded by steep convoluted escarpments, an effect of the generally flat-lying attitude of the strata. Additional complications of the topographic pattern are due to interbedded volcanic ashes and infaulted Upper Carboniferous sandstones and conglomerates. A similar landscape lies east of the Bovey Basin, between Chudleigh and the estuary of the Teign. 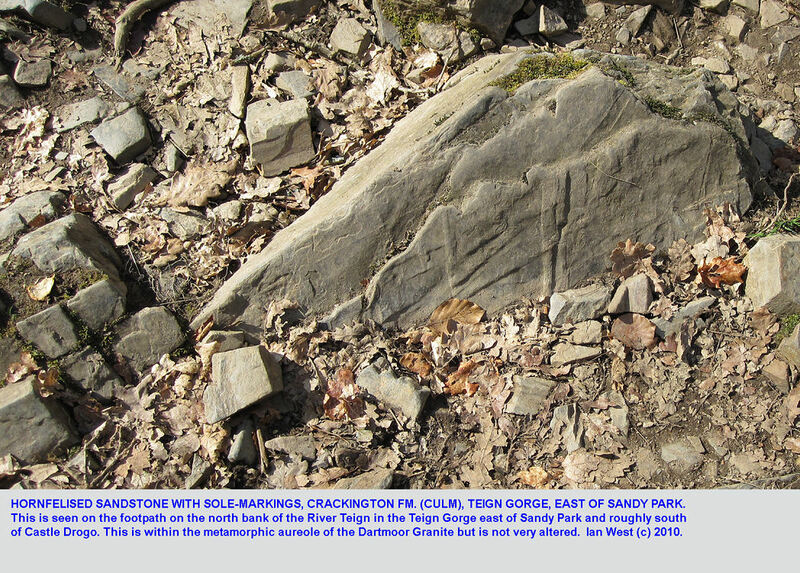 The Devonian rocks of these two areas have been carried northward and westward over the Upper Carboniferous along a major thrust fault or thrust complex. The Bovey Basin extends south-eastwards from the edge of the granite 3km north-west of Bovey Tracey to Aller, south of Newton Abbot. The greater part of this area is a well-defined plain floored by clays, sands and lignites of Tertiary age. Much of the ground is low-lying moor or heath with silver birch and fairly extensive coniferous woodland. 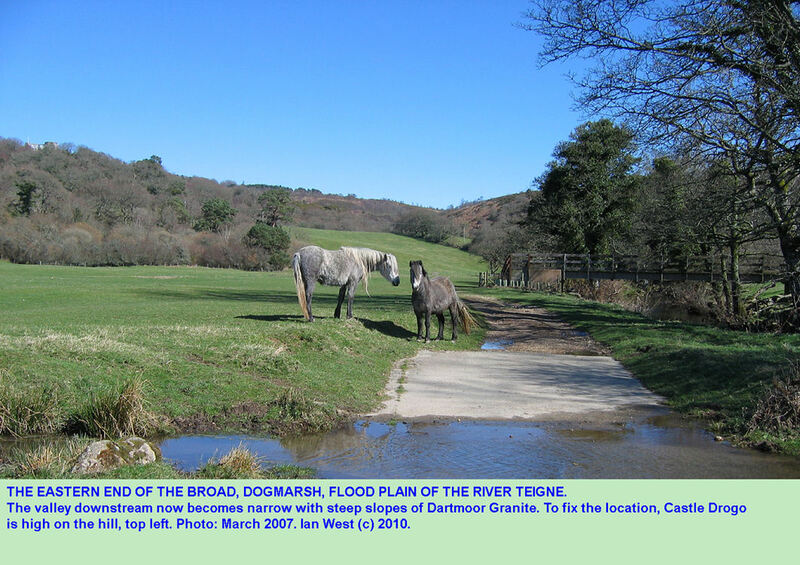 The Bovey Basin has developed along the Sticklepath-Lustleigh Fault Zone, one of the great north-west-south-east dextral wrench faults of Cornubia." Blyth, F.G.H.B. 1962. The structure of the north-eastern tract of the Dartmoor Granite. Quarterly Journal of the Geological Society, 1962; vol. 118; issue.1-4; pp. 435-451. By Francis George Henry Blyth. 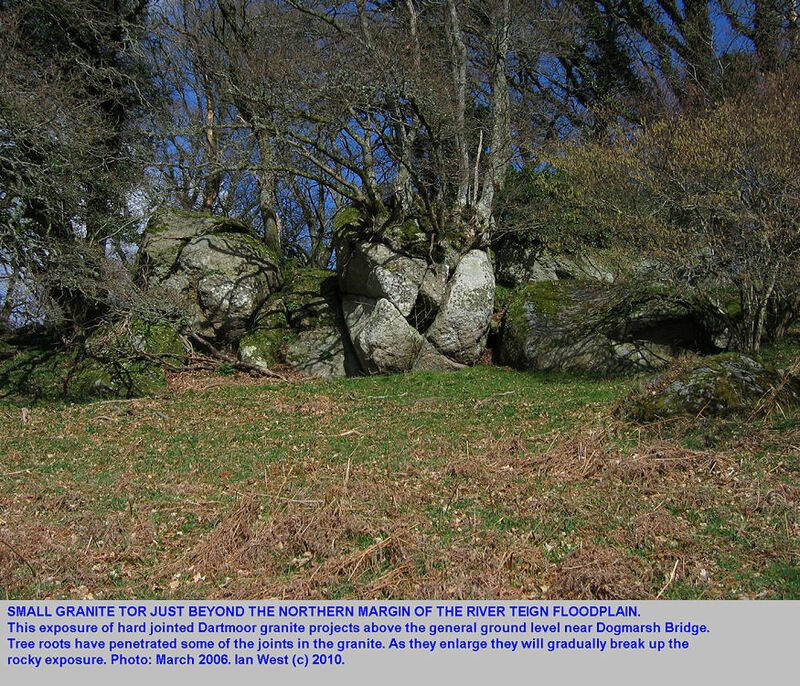 Abstract: The granite margin from Sticklepath to Bridford, of which the only map hitherto available has been the one-inch Old Series sheet 25 dating from 1866, has been re-mapped, together with the rest of the area lying north-east of the Lustleigh-Sticklepath fault-system (Blyth 1957). Complex faulting in the Lustleigh area is described. The fracture-pattern consists of a late NW-SE fault-system with associated NNW-SSE faults, which is superimposed on an earlier series of fractures including joints, aplites, and tourmaline and haematite veins. The northern part of the Dartmoor granite is visualized as a thick intrusive sheet with an outwardly dipping contact against Lower Culm sediments. More than one episode of movement on the NW-SE. and NNW-SSE. faults is postulated, and some part of it is thought to be of Tertiary age. This has resulted in an area of broken granite which has been more readily eroded than the area to the south-west of the faults. Bonney, T.G. 1887. On the microscopic structure of luxullianite. Mineralogical Magazine, vol. 1, pp 215-221. Meldon Case Study: Information Sheet 1E. The Dartmoor Granite and Associated Igneous Rocks. 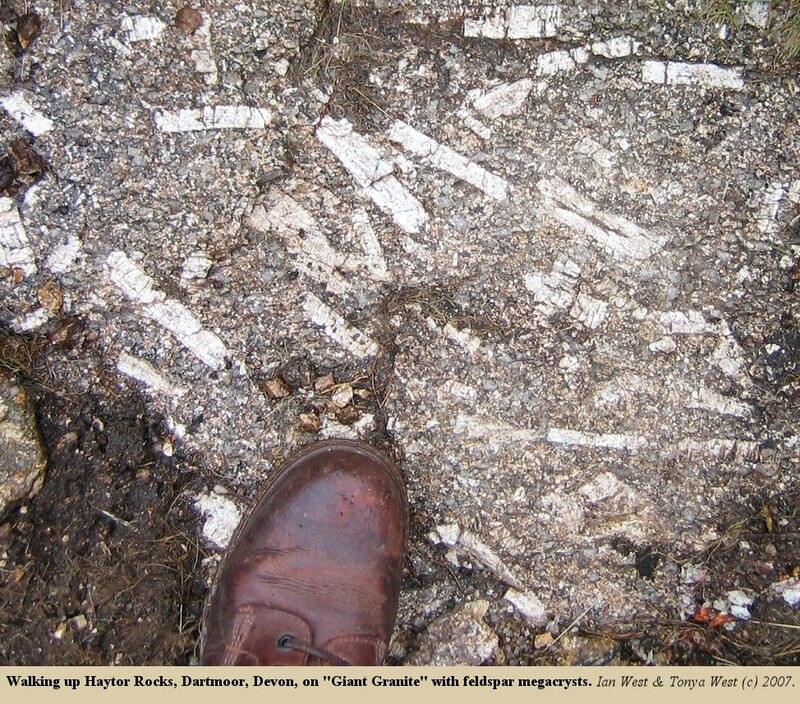 [This paper emphasises a sheet-like origin for the megacrystic (i.e. Giant Granite or Big-Feldspar granite, the common granite with the large crystals, and usually seen in the tors]. The Dartmoor granite is .... composed of interlocking crystals of white orthoclase feldspar, clear quartz and shiny black flakes of biotite mica. The feldspar crystals, whether exceptionally large (e.g. megacrystic), or not, are commonly well formed and frequently alligned parallel with the flow of the crystallising magma. As cooling continued, quartz and biotite mica grew in the spaces between the large feldspars. .... the Variscan granites of south-west England are relatively rich in boron, and ... the final stages of crystallisation often includes the growth of small clusters of black tourmaline crystals... "
Durrance , E.M., Bromley, A.V., Bristow, C.M., Heath, M.J. and Penman, J.M.. 1982. Hydrothermal circulation and post-magmatic changes in granites of south-west England. Proceedings of the Ussher Society, 5, 304-320. Abstract: Prolonged hydrothermal convective circulation within the granites of south-west England is indicated by metalliferous mineralisation and kaolinisation processes which have acted since the time of granite emplacement. The requirements for hydrothermal circulation - a sufficient heat source and suitable permeability - are found to allow modern convective flow within the granites. 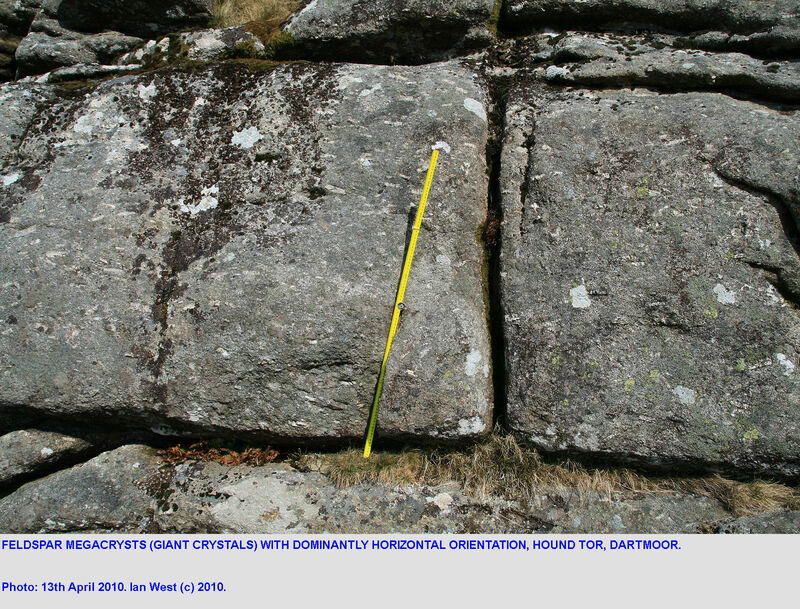 Radiogenic heat maintains the granites at elevated temperatures, and the results of an electrical resistivity survey of the top few kilometres of the Dartmoor granite show that the in situ permeability is likely to be high. 222Rn and U distributions in Dartmoor stream waters suggest that low values indicate sites of convective drawdown, with upwelling in adjacent areas giving high values. Residual compressive stress, acting mainly in an approximately NNW-SSE direction appears to control the high permeability pathways by opening fractures which trend in this direction. The present day heat flow pattern and distribution of thermal mine waters confirms the general character of the convective cells. The evolution of hydrothermal convective circulation since the emplacement of the granites suggests reactivation of convective cells by tectonic activity reopening fractures and the periodic input of enhanced mantle heat flow. Mapping of modern hydrothermal convection cells provides information which can lead to the prediction of hidden metalliferous mineralisation and china clay deposits, and has important implications for the efficient exploitation of geothermal energy. Durrance, E.M. and Laming, D.J.C. (Editors) 1982 (reprinted 1985, paperback, and 1993). The Geology of Devon . University of Exeter Press. 346 pp. ISBN 0 85989 247 6. This is a key publication on the area. Evan, D.J.A., Harrison, S., Vieli, A. and Anderson, E. 2012. The glaciation of Dartmoor: the southernmost independent Pleistocene ice cap in the British Isles. Quaternary Science Reviews. Vol. 45, pp. 31-53. By David J.A. Evans. Durham University, Stephen Harrison, Exeter University (Cornwall Campus), Andreas Vieli, Durham University. and Ed. Anderson, Stockton Riverside College. Available online 30 May 2012. The granite uplands of Dartmoor have traditionally been considered to be relict permafrost and periglacial landscapes that lay beyond the limits of Quaternary glaciations but a variety of landform evidence indicates that a plateau icefield existed on the northern part of the moor, constituting the southernmost independent ice cap in the British Isles. Overdeepened or weakly U-shaped valley segments fringing north Dartmoor document an early, extensive phase of glaciation but the most convincing landform evidence relates to more recent, valley-based glacier occupancy. A moraine ridge on the Slipper Stones represents the most unequivocal palaeo-glacier on north Dartmoor with a palaeo-ELA of c.460 m above sea level (asl), although this relates to the youngest and most restricted phase of glaciation. A longer term ELA is likely to be represented by the Corn Ridge proto-cirque at 370�410 m asl. More extensive valley glaciers are recorded in each of the major drainage basins of north Dartmoor by arcuate and linear bouldery ridges and hummocky valley floor drift, which are interpreted as latero-frontal moraines deposited by outlet lobes of a plateau icefield. Recession of these lobes is marked by inset sequences of such ridges and occasional meltwater channels. Plateau ice was predominantly thin and protective, and snowblow and preferential accumulation in valley heads facilitated the modest glacial erosion and debris transport recorded in the landforms and sediments. It is proposed that the highest plateaux have been occupied by ice for the longest cumulative period of time throughout the Quaternary (�average glacial conditions�), explaining the distribution of different tor types on northern Dartmoor. This also explains the lack of tors on the most expansive of the highest plateau terrain (ice dispersal centres) as the product of: a) average glacial conditions preferentially removing tors or dampening their production rates; b) the survival of high relief (Type 1) tors during glaciation if they occupy summits too narrow to develop significant plateau icefields and/or ridges that are bypassed by faster moving ice in adjacent deep valleys; and c) the survival of subdued (Type 2) tors in areas glaciated less regularly during the Quaternary. Simple ice flow modelling indicates that a plateau icefield type glaciation is required for significant ice flow to occur and confirms thin ice cover, in particular on narrow summits, thereby supporting the explanation of tor class distribution. The modelling allows us to spatially correlate the geomorphological evidence of margin positions into two major stages and further indicates a strong altitude�mass balance feedback leading to an ice cap that is not in balance with its climate and with an extent that is limited by the length of the cold phases rather than their severity. Exley , C.S. and Stone, M. 1964. The granite rocks of south west England In: Present views of some aspects of the geology of Cornwall and Devon. 150th Anniversary Volume. Royal Geological Society Cornwall. Gunnell, Y., Jarman, D., Bracuher, R., Calvet, M and Delmas, M. 2013. The granite tors of Dartmoor, Southwest England: rapid and recent emergence revealed by Late Pleistocene cosmogenic apparent exposure ages. Quaternary Science Reviews, vol. 61, 1st February 2013, pp. 62-76. Dartmoor, in SW England, is a classic periglaciated granite upland adorned with a population of over 150 tors. The origin of the tors has been controversial, but their emergence by differentiation after stripping of regolith during Pleistocene cold phases is accepted. However, their actual age has been unknown, with possible scenarios ranging from preservation since the early Middle Pleistocene to relatively short-lived landforms in a maritime climate with high denudation rates. The latter is now supported by 32 cosmogenic surface exposure dates from 28 tors across the whole upland. The distribution of apparent 10Be ages peaks strongly in the Middle Devensian (36�50 ka), which with corrections for weathering and limited ice shielding could be interpreted as Early Devensian. These ages are much younger than those found for three glacially unmodified Cairngorms tors, and somewhat younger even than glacially modified Cairngorms tors. The dates show little spatial variation. Although an ice cap has now been modelled in the heart of northern Dartmoor, tors here are of median age, suggesting that ice cover sufficient to shield tors from incoming radiation was of short duration. The few younger tor ages support the idea of continuing landform instability across the landscape, with weathering flakes redeveloping soon after inferred loss of top pillows by gelifraction or gravitational toppling. The few older tor ages have no systematic explanation, and may indicate inheritance from an earlier cycle of bedrock near-exposure. Since most tors are modest in height (typically 2�5 m), volumetrically insignificant, and often in advanced stages of disintegration, the general impression is that they are evanescent features, which emerge and quickly disappear during every Pleistocene climatic downturn. Tor populations may thus flicker across the landscape rather randomly over the Quaternary. The remarkably consistent age of the present tor population could be associated with a stripping event at the start of the Devensian, but fuller analysis must await closer controls on tor denudation rates in different climatic phases, and on ice cover extent and duration. 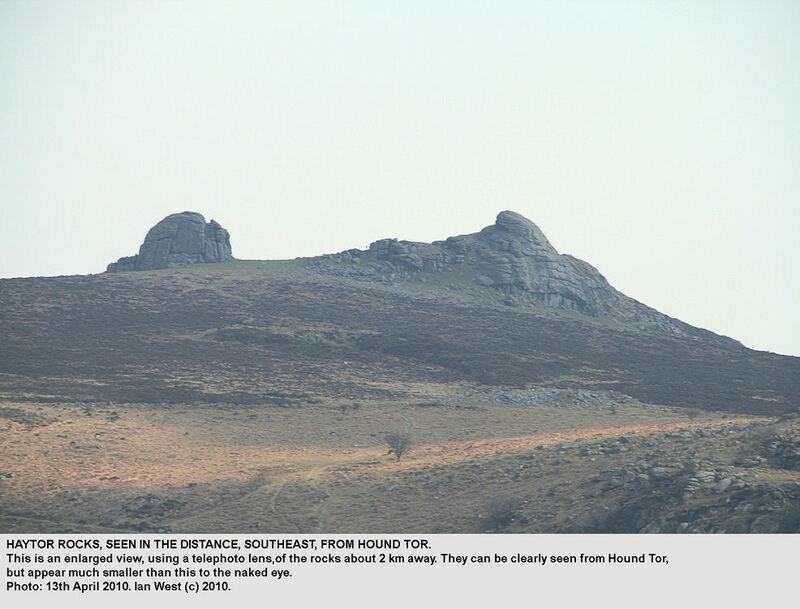 These results only date extant tor surfaces, not the landscape, but as the best available erosion pins they have evident value in exploring theories of the evolution of Dartmoor during the Quaternary. Hawkes , J.R. 1982. The Dartmoor Granite and later volcanic rocks. In: Durrance, E.M. and Laming, D.J.C. (eds.) The Geology of Devon. Exeter. 85-116. Lister, C. J. 1978. 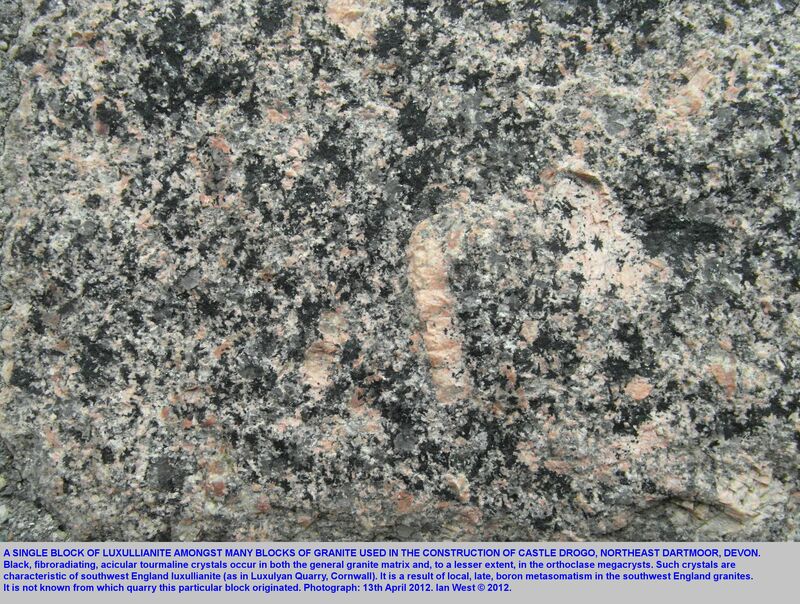 Luxullianite in situ within the St. Austell granite, Cornwall. Mineralogical Magazine, June 1978, vol. 42, pp. 295-297. By Carol J. Lister, Department of Mineralogy, British Museum (Natural History), Cromwell Road, London, SW7 (work carried out while she was a student at King's College, London). The full, but short, paper is available online. Search: "Lister luxullianite" or go to the website: Lister,C. 1978. Luxullianite in situ within the St. Austell granite, Cornwall. Luxullianite has long been regarded as a petrological curiousity, unique to its type locality at Luxulyan, near St. Austell. Distinctive in appearance, it consists of pink alkali feldspar phenocrysts in a black groundmass of tourmaline and quartz, and is characterised texturally by radiate 'suns' of acicular tourmaline. Previous descriptions, however, relate exclusively to loose boulders of luxulianite found in fields (e.g. Bonney, 1877; Wells, 1946). This note reports the discovery of several veins of luxullianite currently exposed in situ in a granite quarry near Luxulyan, both in the working face and in the quarry floor. The veins take the form of vertical sheets within the granite, and range from a few centimetres to about one metre in thickness. Their SW-NE orientation corresponds with local joint directions. One of the largest luxullianite veins is laterally discontinuous, dividing into three parallel veins with a total thickness of 2m, before reuniting into a single vein that narrows and disappears altogether. The total length of this vein system, exposed as quarrying progressed, was about 25m. 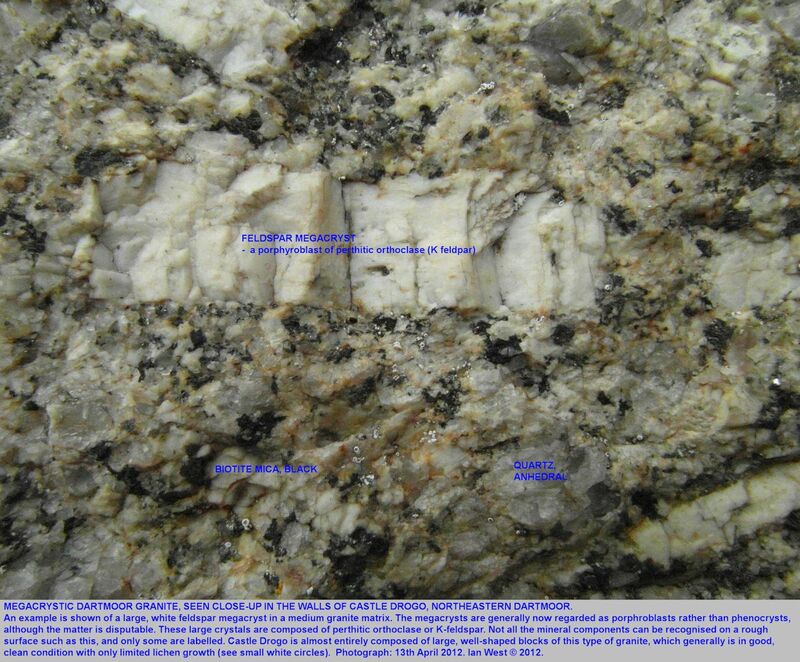 The contacts between luxullianite and granite are gradational, and it is clear that the luxullianite results from metasomatic alteration of granite in situ, and not from the emplacement within the granite of a late stage magma. Abstract. Contrasts are drawn between tourmaline habits and textures observed in two different luxullianite veins, one in the St Austell granite and one on Dartmoor. 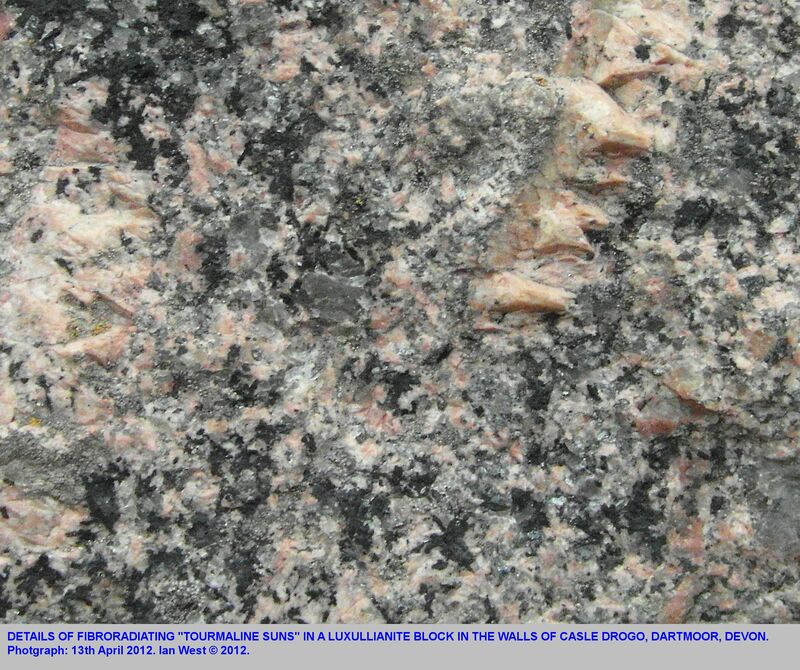 Luxullianite is one of the less common varieties of tourmalinised granite found in south-west England. Material previously described has generally been taken from loose boulders, rather than observed in situ within the parent granite (Bonney 1877: Wells 1946). 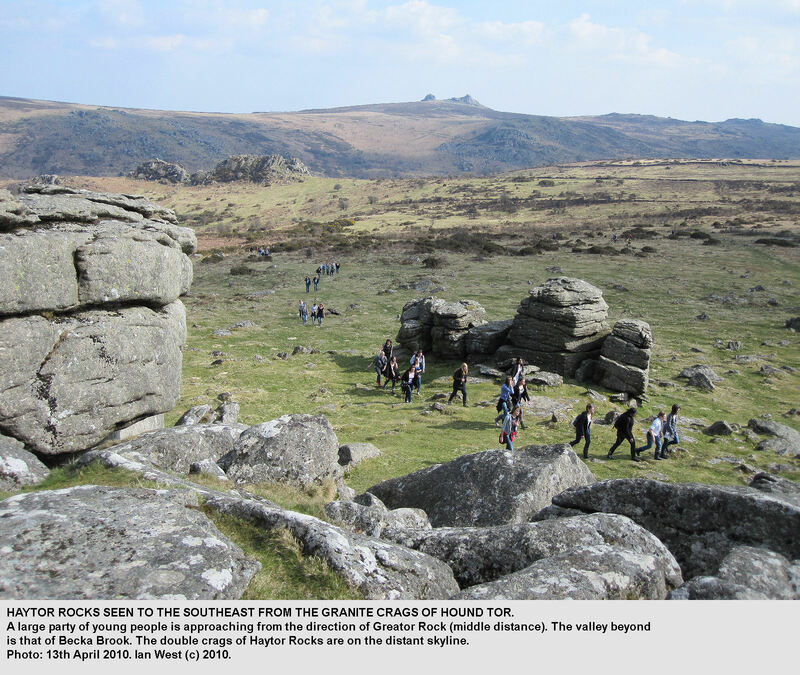 Two in situ occurrences of luxullianite type rocks have been described, one from the eastern part of the St Austell granite close to the type locality (Lister 1978), and one from east Dartmoor (Blyth 1949). In both localities the tourmalinised rock occurs as vertical veins up to 2 metres wide, within potassium feldspar megacryst bearing granite. The Dartmoor vein lies within a larger zone of reddened granite containing pink feldspar megacrysts and large rounded quartz crystals in a finer-grained matrix; this texture is reminiscent of those found in zones of wall rock alteration associated with metalliferous lodes in the vicinity (R. Scrivener, personal communication, 1978). In the St Austell example, however, the reddening is confined to the luxullianite veins. The mineralogy of the tourmalinised material is superficially similar in each case, with pink alkali feldspar, quartz and tourmaline forming the major components. However, the tourmalines show definite textural differences, reflecting their mode of formation (Blyth referred to "luxullianite" in inverted commas, presumably to imply this textural difference). The tourmalinisation process has in each case been studied by microscopic examination of material transitional between granite and its alteration product; thus it has been possible to observe mineral grains at various stages of transformation, and to suggest possible origins for the tourmaline varieties present. [continues]. National Trust. 2012. Castle Drogo. Castle Drogo, the last castle to be built in England, with dramatic views over Dartmoor. National Trust website with visitor information. Perkins, J.W. 1972. 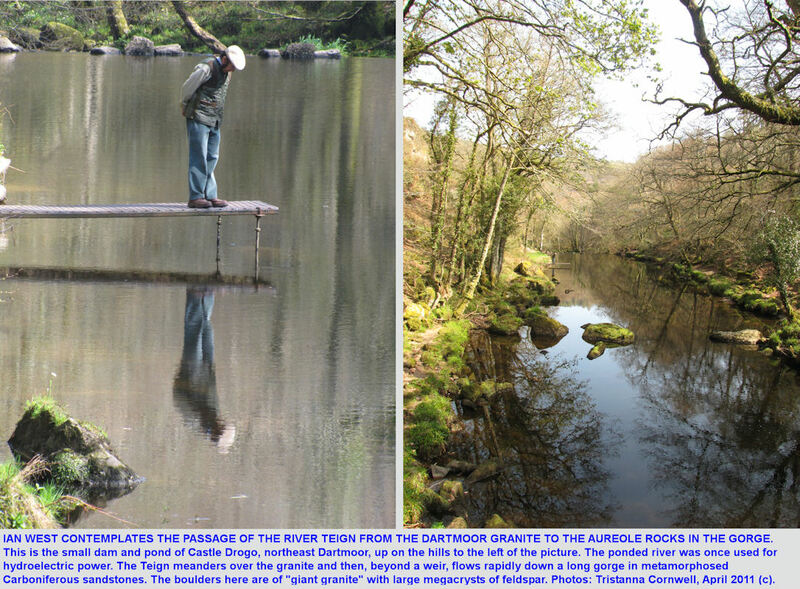 Geology Explained: Dartmoor and the Tamar Valley. By John W. Perkins, B.A., F.R.G.S. Illustrations by the Author. 196 pp. David and Charles, Newton Abbot. [Like the other books in this series of "Geology Explained" this is an excellent geological guide book with superb, informative, labelled sketches]. Popham, C. 2010. The Granite and Quarries at Haytor. 12 September 2010. 8 pages, available in full online. Reid , C., Barrow, G., Sherlock, R.L., MacAlister, D.A., Dewey, H., and Bromehead, C.N., with contributions by Flett, J.S. and in part from notes by Usser, W.A.E. 1912. The Geology of Dartmoor. Memoirs of the Geological Survey, England and Wales, Explanation of Sheet 338. London: Printed for Her Majesty's Stationery Office, by Darling and Son, Ltd., 34-40 Bacon Street, E. 102 pp. and 2 plates. Original price: Two Shillings and Threepence. By Clement Reid, F.R.S., et al. 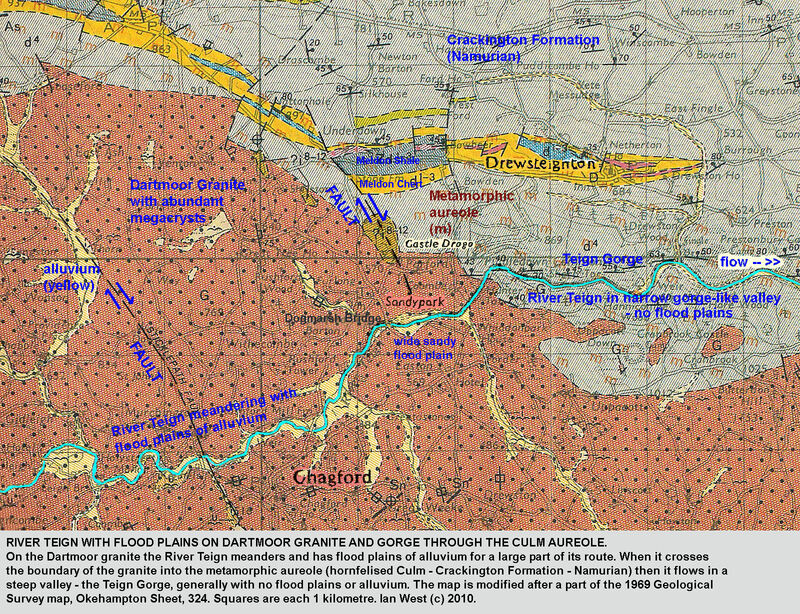 "The following page describe the geology of an area of 216 square miles in Devon, including the greater part of Dartmoor. No coast line or tidal estuary cuts into this district, and the Moor, which is the highest land in south-western England, dominates everything. The geology we have to deal with is essentially the geology of Dartmoor; for the rocks outside the actual borders of the granite are either baked by the granite, or have been thrust aside by the intrusion of this granite. .
Large masses of Dartmoor rise 1,500 feet above the sea and much of it is over 1,700; at several points it exceeds 1,900 feet, but the only tors reaching 2,000 happen to lie just beyond our border. The highest points within the map described in this Memoir are Cut Hill, which reaches 1,981 feet, and Whitehorse Hill, which rises to 1,974 feet. These two hills, two miles apart, represent the watershed and central area, from which the rivers radiate north, south, east, and west; the somewhat higher tors further north are not on the watershed. This central and northern area is also the wettest and most peaty part of Dartmoor, for it has an annual rainfall of about 60 inches. All the land above 1,600 feet rises into the region of clouds; so that not only has it an exceptionally heavy rainfall, but the constant mists and slight evaporation tend to make it a far more efficient feeder of the streams than its area alone would suggest. The wide-spread upland peat-mosses of Dartmoor in which the rivers rise occupy most of the land above 1,600 feet, i.e., the area north-west of the Princetown and Moretonhampstead road. These mosses form continuous sheets clothing the highest land, and in this they are quite unlike the 'basin-peats' of the other and lower granitic areas in Devon and Cornwall. The growth of the peat is directly connected with the elevation; for the land above 1,600 feet, as already mentioned, is liable at all times of the year to be wrapped in cloud. Thus a peaty vegetation grows, and peat accumulates on slopes that at any lower elevation would show merely a rough boulder-strewn granitic soil. 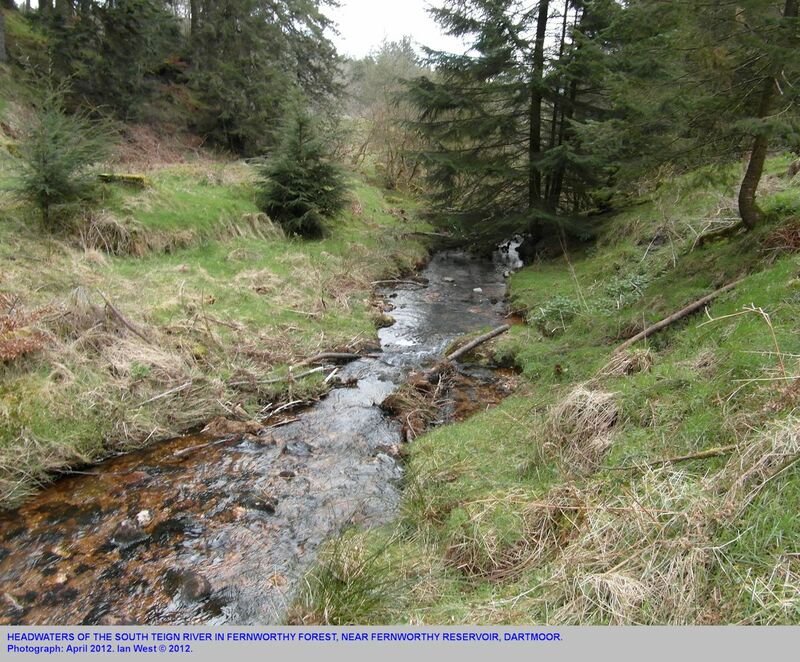 Streams from Dartmoor feed all the principal rivers of Devon, and many of them have in Dartmoor their principal source, even though their catchment area on the Moor is not so large as tnat in other parts of the basin. 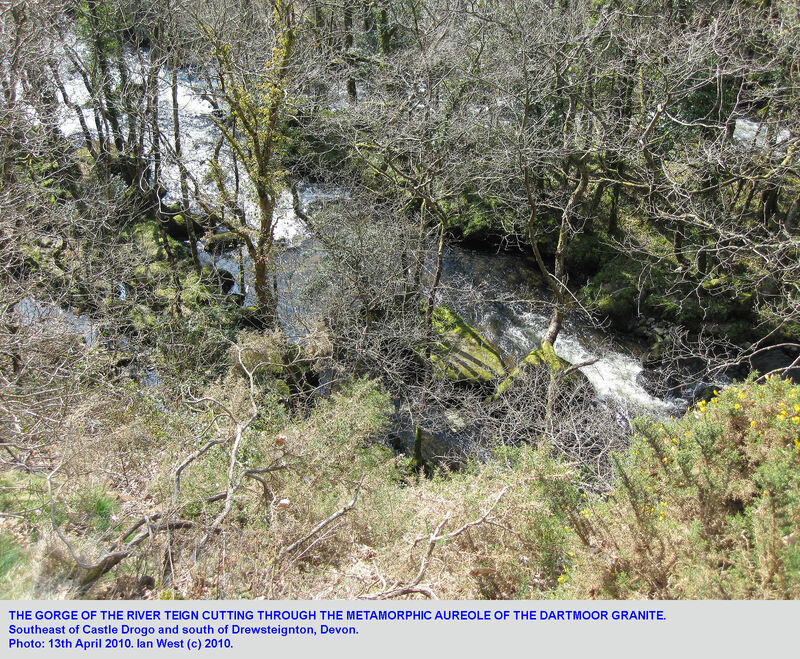 This radiation of the streams from a central point on Dartmoor, though conspicuous now, was formerly of far greater importance. It seems to date back to early Tertiary times, when probably the Moor was much higher, and the sea had not so greatly trenched into the surrounding lowlands. Eocene rivers flowed westward to Penzance, eastward across Devon into Dorset, and probably northward also to Bideford. 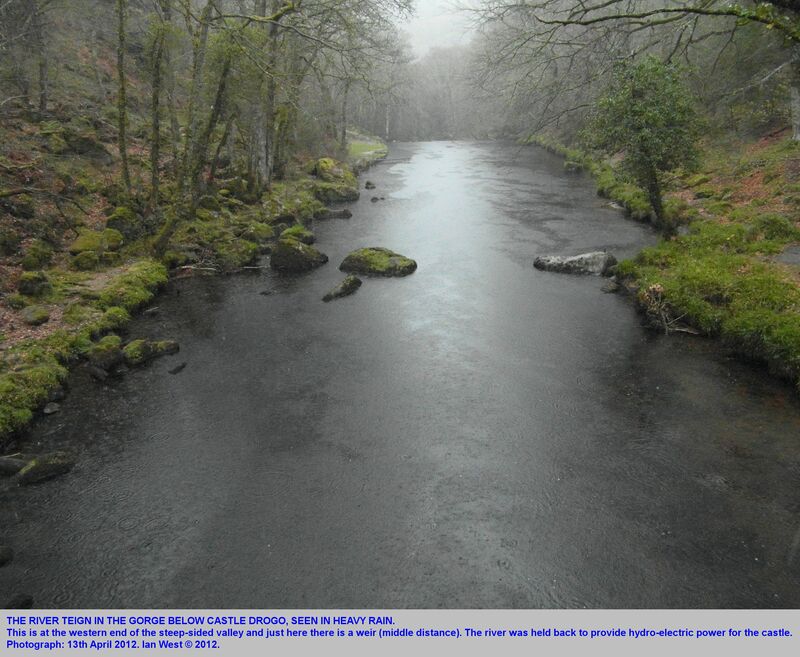 The streams that now descend the northern side of Dartmoor to reach the sea on the north coast are the Okement, one of the principal branches of the Torridge, and the Taw; both of which flow into Bideford Bay. Tributaries of the Teign also descend the northern slope of the Moor; but this river, after leaving the granite, takes a very strange course, for it flows eastward and then turns southward, receiving in its course to the sea at Teignmouth various eastward- and southward-flowing streams, which also rise on the Moor. The Dart and its numerous tributaries drain nearly half the Moor, flowing southward and eastward to combine near Ashburton, after which the river holds a southeastern course to Dartmouth. The south-flowing rivers, the Avon, Erme, and Plym, only flow for a short distance within our area, and then follow a normal course to the sea. Streams from the west side of Dartmoor form the head-waters of the Tavy and some of the smaller tributaries of the Tamar, both of which empty into Plymouth Sound. It will be understood from the foregoing account that a large part of the area of which we treat is unenclosed moorland. A good deal of the rest is too steep for cultivation, being deeply trenched by the rivers and the slopes clothed with timber. The remainder, especially where greenstone and schalstein occur, is often good land, though naturally its close proximity to Dartmoor and the consequent heavy rainfall make it more suitable for dairy-farming than for cereals. On the Moor numerous ponies run half-wild, and excellent crops of potatoes are raised. In addition to agriculture there is a certain amount of mining around Dartmoor, though in the heart of the Moor the mines are of little value. Copper, tin, lead, silver, iron, arsenic, and manganese have all been worked, as well as ochre and umber. Granite is quarried, and London Bridge was built from the granite of Haytor ; the cost of carriage however is a serious obstacle to extensive working, for the rock has to be carted or taken by tramway several miles to the barge, and there is no deep-water harbour within reasonable distance. The peat-mosses, just now of little economic importance, will be worked again as fuel becomes more expensive and the better methods now in use are applied. The extensive peat-area north of Princetown and Postbridge is still however without roads and difficult of access. Peat was formerly used in the smelting of the tin-ores; but the alluvial tin has now all been removed, and the peat is only required for ordinary fires. It may be said in conclusion, however, that Dartmoor and its surroundings owe much of their present importance to their value as a health resort, as a national playground, and as a region of great scientific interest. To these aspects of the geology special attention will therefore be paid in the following pages. PLEISTOCENE - Valley Gravel and Head.	.
Shale and Grit (Upper Culm ?). Shale, LImestone, and Grit (Lower Culm). Upper - Slate and thin Limestones. In addition various types of metamorphic rock occur in the neighbourhood of the granite and others are found close to the masses of greenstone. Abstract: The sequence CGM- (megacrystic), PM- (poorly megacrystic), FG- (fine-grained) granite in the Dartmoor pluton is magmatic and broadly follows the variation patterns already observed in the Carnmenellis and Isles of Scilly plutons. Like these, the Dartmoor granites contain high trace-alkalies, Nb, F, Sn, U and Th, which, together with high �180, suggest a crustal S-type source. However, unlike these granites, the CGM granite of Dartmoor is more basic, has a lower initial 87Sr/86Sr ratio, higher total REE, flatter REE patterns, and metaluminous to peraluminous basic microgranite (BM-granite) enclaves that contain occasional hornblende and titanite. These more I-type characteristics suggest the participation of a minor, but important, subcrustal component. Continuity in several features with BM-granites indicates transition from granitoids with some I-type to dominantly S-type features. Additional evidence for an important, but subordinate, subcrustal role is provided by the associated nearby Permian volcanism and Li-mica granite and recent isotope data. 1. The predominance of BM-granite inclusions in the CGM-granite suggest that it was emplaced first, followed immediately and perhaps continuously by a slightly more evolved PM granite magma containing few or no BM-granite inclusions. This view contrasts with that of Ward et al. (1992) who consider that a parent PM-granite magma gave rise to the CGM-granite magma as a marginal cumulate. Biotite and dominant feldspar fractionation during transit from the lower crust could account for the overall evolution of the biotite granites in the Cornubian batholith. However, in the case of Dartmoor, the production of an early more basic granitoid ('mixed') magma would account for the occurrence of the microgranite inclusions, and hornblende, followed by feldspar fractionation, would generate the presently exposed peraluminous granite sequence. 2. High initial 87Sr/86Sr and delta18O values and the occurrence of S type granites with cordierite and almandine in some facies, point to a significant crustal greywacke/pelite contribution. However, the transition from I- to S-type characteristics shown by the range of BM-granite inclusions and the sequence from BM-granite to S-type FG-granite imply the initial participation of a subcrustal source for the more basic inclusions. This implication is strengthened by the relatively flat REE patterns, yet high tREE and the recent Nd-isotope data (Darbyshire and Shepherd, 1994) which point to a lower crustal source of greywackes and mafic volcanic rocks with minor basaltic (mantle) material. 3. Compatibility in certain critical aspects of Dartmoor data (REE patterns and the position of the composition field in the Nb vs Y plot, together with higher overall 'femic' suite contents Figure 3. Means and 95% confidence intervals (from Minitab, as in Fig. 1) of TiO2 (wt.%), Zr (ppm), Y (ppm) and ASI (cf. Table 1)for the outer (Gm) granites of Carnmenellis (C, 34 samples) and the Isles of Scilly (S, 22 samples) and the CGM-granites of Dartmoor (D, 26 samples). All data were obtained in the Exeter laboratories. compared with the Carnmenellis and Isles of Scilly granites), combined I- and S-type features and transition from one to the other, together with the isotope data, favour minor contamination of palingenetic granitic magmas of lower crustal origin by basic magma before subsequent differentiation. As in the Lundy granite, the occurrence of both mantle and crustal components suggest that basalt magma underplated and intruded lower continental crust (Huppert and Sparks, 1988; Stone, 1990; Thorpe et al., 1990) resulting in partial melting and the production of granitic magma that subsequently mixed with some basic magma to produce the parent from which the Dartmoor sequence was derived. A similar conclusion is reached by Clark et al. (1993). 4. Additional evidence for an important role of the mantle or crust/mantle interface in the generation of the rocks of the Dartmoor pluton lies in the close temporal and spatial association with Permian volcanism (Thorpe, 1987; Leat et al., 1987) and the near contemporaneous Li-mica granite magmatism at Meldon. It is significant that the biotite granites of St. Austell (Darbyshire and Shepherd, 1985; Manning and Hill, 1990) and Tregonning-Godolphin (Stone, 1992) also differ geochemically from the Bodmin Moor and Carnmenellis granites but are closer in composition with the Dartmoor granites (data in Darbyshire and Shepherd, 1985; and unpublished data) and each is associated with Li-mica granites. This suggests that the genesis of some of the Cornubian plutons (Tregonning-Godolphin, St. Austell and Dartmoor) were associated with more mantle or crust/mantle interface activity than the others (Isles of Scilly, Carnmenellis and Bodmin Moor). Ward, C.D., McArthur, J.M. and Walsh, J.N. 1992. 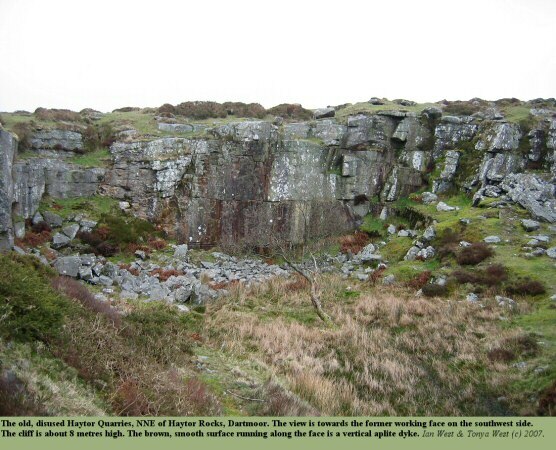 Rare Earth Element Behaviour During Evolution and Alteration of the Dartmoor Granite, SW England. Journal of Petrology, (Oxford Journals) vol. 33, part 4, 785-816. Ward, McArthur and Walsh, 1992. Rare Earth Element etc. Wells, M.K. 1946. A contribution to the study of luxullianite. Mineralogical Magazine, vol. 27, pp. 186-194.